Safesil is a special blend of food-grade preservatives that eradicates all the major spoilage organisms. Proven to be supremely effective across a wide range of dry matters and crops. At 3m wide and weighing about 4,000kg with 11 individual roller rings, a SilaPactorspeeds up the compaction process almost four-fold, saving both time and fuel and can increase dry matter compaction density by up to 40% when compared to conventional tractor rolling. O2 Barrier 2in1 is applied as a single sheet which transforms into two on the clamp; a protective, high-quality top layer covering a layer of very oxygen impermeable, polyamide vacuum film. O2 Barrier provides quick and effective clamp sealing with reduced workload, and up to a tenfold decrease in oxygen permeability. 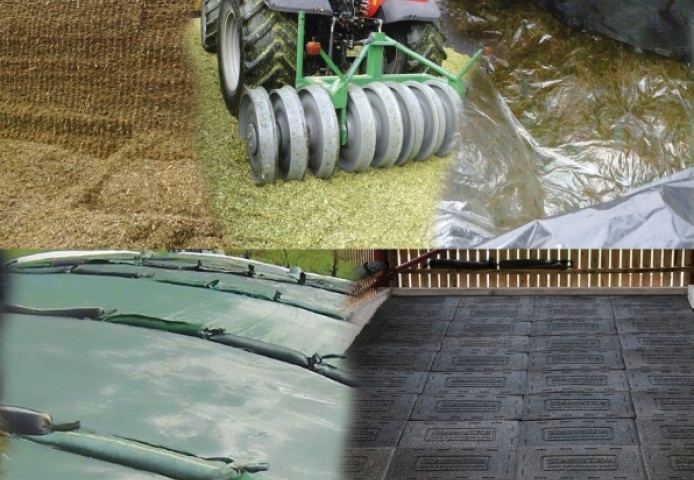 ClampNet is a 300g/m2, heavy-duty green silage cover with seamed, stitched edges to prevent fraying or unravelling. It offers added protection from attack by birds and vermin and also helps to maintain compaction. Made from 90 per cent re-cycled material with a life expectancy of around 15 yearsClampTiles are ergonomically designed for ease of handling. Unlike tyres, they don’t harbour rainwater and debris, and when not in use can be stacked on pallets.